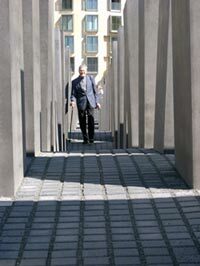 Following the May 10, 2005 unveiling of Germany's "Memorial to the Murdered Jews of Europe," Rigny, an American citizen and longtime resident of Berlin, visited the site. Here are his observations and some photographs that he took. Rigny was an associate producer on Marian Marzynski's film, "A Jew Among the Germans," and is a translator and film subtitler. He is currently at work on "Ray Russell's Berlin," a documentary about a former pilot who fell in love with Berlin in 1947 and returns to the city every year. After 17 long years of debate, the memorial is finally built. And although the response has been overwhelmingly positive, the first minor scandals were not long in coming, even as the memorial was nearing completion. First, Lea Rosh, one of the initiators of the project, shocked the public by announcing plans to embed a tooth of an unknown Holocaust victim -- which she found while visiting a concentration camp in Poland -- inside one of the memorial's pillars. Only after representatives of Jewish organizations expressed their horror at such bad taste did she retreat from her plans and agree to return the tooth to the place she found it and have it buried according to Jewish ritual. The other headlines revolved around the questions of etiquette: What is allowed and not allowed at such a memorial? Is having lunch on a pillar OK? What about smoking a cigarette? When photos began appearing after the memorial's unveiling showing kids jumping from pillar to pillar, the consensus was that this was not acceptable. Such activity was seen as a desecration to such a solemn site of Holocaust memory. When I visited the memorial a little more than a week after its unveiling, I found that this concern about respect and solemnity that one would expect from a memorial to the Holocaust was indeed a legitimate question. I found a new landmark, a piece of public art, a walk-through sculpture that, in accordance with architect Peter Eisenman's wishes, is open to the visitors' own interpretations. 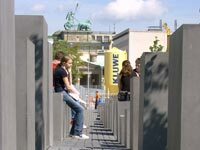 Yet, Eisenman did commit himself to one specific interpretation: The memorial should convey the sense of what it was like to be a Jew in Germany -- the hopelessness, the claustrophobia, the sense of entrapment that Jews must have felt under the Third Reich. However, the main impression that I took away from the memorial was the free association of modern art, for good or for bad. As I walked through the narrow passages between the pillars, voices echoed visitors' sentiments as they grappled with their impressions: "It's about the experience of being shipped off in cattle cars," said one visiting American. His friend wasn't convinced. "Isn't it supposed to be more about the people?" he asked. One elderly woman was clearly moved: "The innocent children. There was nothing they could do about it." A teacher asked her class what the fluctuating sizes of the pillars could possibly mean. She dwelled on this detail for a while, before stating that the central message of the memorial is its similarity to a giant graveyard. "Very impressive," said another visitor. "Not at all unsettling, as I had expected." My most prevailing impression, however, was that of children playing hide and seek, darting in and out of the pillars, calling out to their friends. Like in a labyrinth, many visitors became lost: "Wait, weren't we here before?" "No, this way." For many kids, it was a giant adventure playground. To me, the memorial seemed surprisingly free of associations to the Holocaust. (Due to long lines, I did not enter the underground museum annex, which will certainly put the memorial in a more specific context.) If you didn't know it was a Holocaust memorial, you might be forgiven for mistaking it for a vast field of modern art. In fact, friends of mine visiting Berlin stumbled upon it without knowing what it was and were harshly reprimanded for standing on a pillar to get a better picture. "I had no idea what it was," said my friend, "and this German started yelling at me to get down off the pillar." I told him that it was the new Holocaust memorial. "Oh, now I get it." Interestingly enough, one of the arguments that opponents repeatedly bring up is that the memorial will be a sanitized state remembrance site for wreath-laying ceremonies and other state visits. So far, those fears have not been substantiated. On the contrary, the memorial runs the risk of losing much of the reference to the Holocaust through its associative openness.